I am determined not to have Mosquitoes ruin my summer. They are annoying. I hate them. They serve no purpose that scientists can determine. Most of all, they WEREN'T invited to my yard. So I've done some reading and came up with a game plan combat these useless, disease spreading, highly annoying insects. FYI, did you know that the oldest known mosquito with an anatomy similar to modern species was found in 79-million-year-old Canadian amber from the Cretaceous. And an older sister mosquito species were identified to be nearly 100 million years old. Anyway... I don't care. On to my plan of mass repellence and assassination. 1. Limit Breeding & Adult Habitat - Yep, got it... no standing water, cut long grass and weeds down. 2. Love Dragonflies - The dragonfly nymph eats mosquitoes at all stages of development and is quite effective in controlling populations. Dragonflies are attracted to mosquitoes and all the things that mosquitoes are attracted to so there really isn't too much more to do to get them to your yard... it's kinda a catch 22. Although bats and Purple Martins can be prodigious consumers of insects, less than 1% of their diet typically consists of mosquitoes. Neither bats nor Purple Martins are known to control or even significantly reduce mosquito populations. 3. Use Safe Repellents - I've stocked up on OFF! FamilyCare Insect Repellents and OFF! Clip-on for the baby strollers. I'm also going to try the OFF! Eucalyptus Lotion and I keep hearing that Watkins Insect Repellent works really well. We've also been using Raid Yard Guard Outdoor Fogger around the garage and deck. 4. 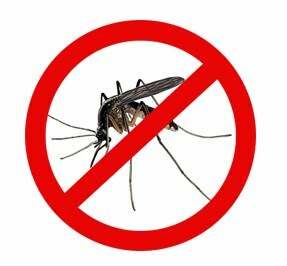 Try Natural Repellents - Apparently these natural, volatile plant oils will effectively repel mosquitoes, but they require frequent reapplication and higher concentrations: Citronella Oil, Lemon Eucalyptus Oil, Cinnamon Oil, Castor Oil, Rosemary Oil, Lemongrass Oil, Cedar Oil, Peppermint Oil, Clove Oil, and Geranium Oil. This is where Citronella Candles fit in. Another plant-derived substance, pyrethrum, is an insecticide. Pyrethrum comes from the flowers of the daisy Chrysanthemum cinerariifolium. Time to plant some Chrysanthemums! 5. Reduce Personal Attractants - Mosquito prefer some people over others. The preferential victim's sweat simply smells better than others because of the proportions of the carbon dioxide, octenol and other compounds that make up body odour. Perspiration attracts mosquitoes because of the chemicals it contains and also because it increases the humidity around your body. Even small amounts of water (e.g., moist plants or mud puddles) will draw mosquitoes. Dark Colors attracts mosquitoes because they use vision to locate hosts from a distance... so dark clothes and foliage are initial attractants. Carbon Dioxide is hard for you to control however you give off more when you are hot or have been exercising. Lactic Acid is released more when you have been exercising or after eating certain foods (e.g., salty foods, high-potassium foods like bananas). Floral or Fruity Fragrances in perfumes, hair products, and scented sunscreens, fabric softeners and dryer sheets all attract mosquitoes. 8. 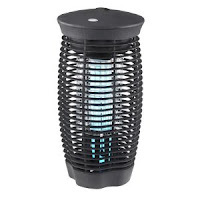 Mosquito Stinger - The Stinger Electronics Zapper lures the insects to the zapper utilizing octenal attractant, and once they are close enough…ZAP! Some experts say these don't do much to control mosquitoes, but I'd have to disagree. We put ours about 10 feet away from our deck to lure mosquitoes away from the house. It's ridiculous how much we hear it ZAP and when we empty it how many THOUSANDS of mosquito's we've assassinated!! We've had ours for a few years, but I just saw it advertised in the Canadian Tire Flyer. It's extremely satisfying to hear zaps of death and I will gladly continue this mosquito torture. Lastly, we put up a Gazebo so we have some additional protection and I have mosquito netting for the baby strollers so I can take walks with out being paranoid that my kids will be bitten. I think I'm ready you blood suckers. A great idea for mosquitos are bat houses, yea bats..eek scary, not really. Bats can eat over 600 insects in an hour and are less likely to have rabies than your pet(0.05%) plus they're endangered. They don't usually bother you either, if your outside at night and one swoops by you it probably just catching an insect that was near you. House sizes vary as well, so you wont get over-run with them. 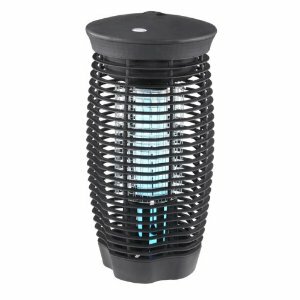 I'm defiantly buying a few, I live in the country and the mosquitoes here are horrible!! Try this - beginning in the springtime, take 100 mg of vitamin B1 daily. Mosquitos, ticks and chiggers apparently don't like the taste of the vitamin. When I remember to do this regularly, mosquitos will buzz around me but never light or bite! I first read of this in Prevention magazine - they did studies on National Guard troops during summer training in Minnesota, where I hear the mosquito is the state BIRD! :) Of course, it won't help your guests, so your other ideas are also essential.